I’ve been a “maker” since before it was a fashionable term for garage-born engineers, artisans, creatives, and inventors. I used to frequently hit barriers in my developing thoughts and think “if I only had something that could...” Now the Cricut Maker is usually my “something” that can. Paired with the powerful new Cricut KnifeBlade, dozens of attachments, media, robust software, and a passionate community of users, the Cricut Maker has me refining and rethinking my creative process. 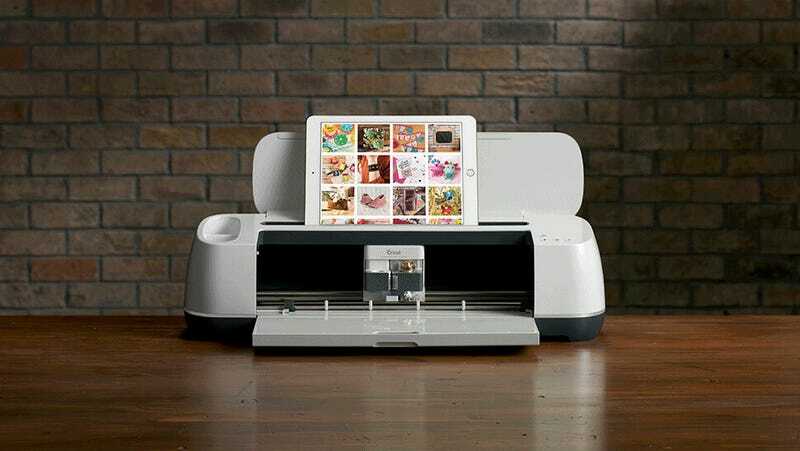 Expanding far beyond their scrapbooking roots, Cricut’s marketers call the Maker the “Ultimate Smart Cutting Machine,” and you won’t argue with them. Just browsing the tested and approved materials list is enough to make you hot with ideas - carbon fiber and Kevlar are among them. Depending on what Cricut Cartridge you have locked and loaded, this system will cut just about anything that’s 3/32 inch thick or less with a density of basswood or lower. The first thing you’ll notice about the Cricut Maker is how heavy and solidly made it is. I expected a tight build for $400, and the Maker over-delivers with exceptionally fine engineering and minute tolerances. It instantly begs you to test its limits and feed it any material that will fit through its rollers. After unboxing, I was directed to a short web address that had me create a Cricut account and install a browser plugin for their design center. iOS and Android apps are also available. Skeptical that a meager plugin was going to do anything useful, I installed it and started poking around. I almost immediately forgot that I was using browser based-software, and I don’t remember the moment it auto-detected my connected Maker. It just did it. In under five minutes I was up and running. I blew through the sample project (a multi-process, multi-material greeting card) designed to get users familiar with the important parts of the Maker. With that out of the way, I browsed the staggering amount of curated projects that would make an instant maker, superparent, or next-level educator out of anyone. Ready-to-make projects include hundreds of papercraft, vinyl, htv, cloth, light leather, and others. With the release of the KnifeBlade, thick leather, wood, and artboard become your playground. Not one for being told what to do, I let my brain guide me. I designed a logo for my U9 soccer team (go Dragons!) last year, so putting adhesive vinyl Team Dragon logos on everything in sight was a good place to start. The software supports the .svg vector file format, among others, so I uploaded DragonsLogo.svg and let the prompts guide me to assign an internal name and then use the file in a new project. Resizing, moving, replicating, mirroring, and countless other features are intuitive to anyone who’s used even the simplest digital asset editing tools. After some adjustments, I pressed “Make It.” Cricut Design Space explicitly walked me through selecting my material, loading it into the machine, locking the correct cartridge into the Maker, and finally setting the machine into motion. Seconds passed. Seconds. And it was done. I had a fairly complex four by five inch Dragons Soccer logo that couldn’t look better if it came from an overpriced sign shop. Out of curiosity, I decided to put up a local online ad for custom vinyl decals and sign work. In the 48 hours my ad was active, I got 15 inquiries for work. Of those, one was too time consuming (for my schedule, not the machine) and four did not agree to my pricing. Of the ten that liked my prices, I kindly cut 24 free custom vinyl decals with the Maker that would have netted me over $200 in profit if I’d actually charged for the work. I could have paid for the machine in under a week with only a few hours of active work... by essentially making stickers. Your mileage may vary, but with minimal effort and skill, this machine will pay for itself. Now I was completely hooked and wanted to play more. I needed to go deeper, so I reached out to Cricut with some limit-pushing material questions. They offered a video call with their lead makers, access to a beta version of the new Cricut Design Space, and an unreleased (at the time) Cricut KnifeBlade + Drive Housing cartridge. The video call was enlightening on fronts beyond the new $40 KnifeBlade Cartridge. The Cricut team is genuinely excited- almost giddy about the Maker platform and the value and flexibility it provides fellow makers. We talked about prototyping tabletop game concepts with it, making puzzles, and other “I can’t wait to do...” projects. I complimented the Maker’s build quality and then watched in shock as they absolutely manhandled the machine, having to brace themselves before grabbing the active carriage during a cut to force a mechanical fault. Smiling with full confidence, one pressed the Cricut Maker’s resume button. The cut in progress continued exactly where it left off. This machine is designed to work for you long-term, consistently, and within a hair’s degree of accuracy. 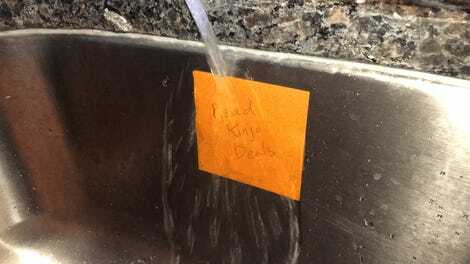 We eventually got around to the KnifeBlade demo, all of my questions, and finally parted with them urging me to try my idea even though it wasn’t officially supported or tested. I immediately placed an order for several small sheets of scrap hardwood veneer on eBay for under $15 shipped. It worked in spectacular fashion. The Maker coupled with the KnifeBlade methodically and precisely cut designs in natural hardwood veneer. This makes creating hardwood inlays for woodworking projects computer precise and creatively limitless. The cuts are so perfect that my assembled test held together without glue while I worked with it. Soon it will be part of a keepsake box. Inlays used to be something that I wanted to do, but had to shelf because I didn’t have time to learn the skill. Now with the Cricut Maker and KnifeBlade, any design I want in wood is moments from realization. The Maker on my desk has not been idle for long during the month I’ve had it. Using Cricut Design Space, my own designs, and free files from sites like VectorPortal.com, I’ve made custom t-shirts, acid-etched glassware, cloth quilting shapes, party decor, vinyl signs, and lots more. I haven’t even had to replace a blade. 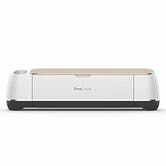 As for capabilities, I’ve only brushed against what this machine can do, a constantly growing array thanks to Cricut’s in-house makers and their strong community of users.